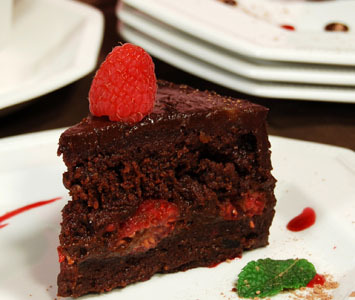 To make the cake, combine the walnuts, cacao powder, and salt in the food processor and pulse until coarsely mixed. Avoid overprocessing. Add the dates and pulse until mixed well. Shape into 2 stackable cakes of desired shape and set aside. To make the frosting, combine the dates and agave syrup in the food processor and process until smooth. Add the avocado and process until smooth. Add the cacao powder and process until smooth. To serve, frost the top of one of the cakes with half the frosting and top with the raspberries. Stack the second cake on top and frost the top and side. Serve immediately, or place in the refrigerator for a couple hours to firm up. The cake on its own will keep in the fridge for many weeks. The frosting will keep separately in the fridge for 1 week. The assembled cake with raspberries will keep in the fridge for up to 3 days.